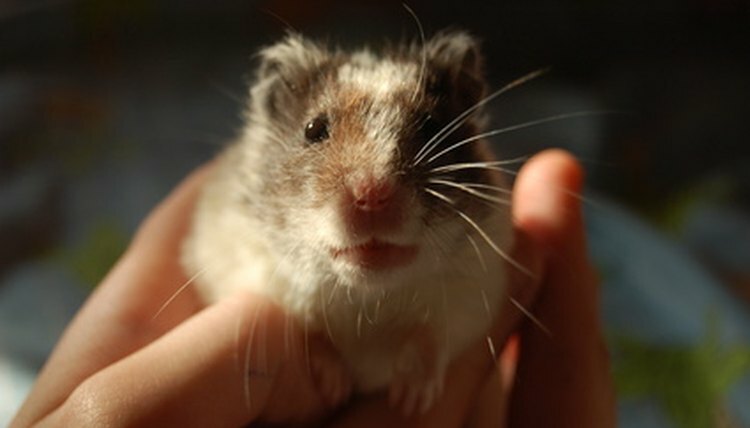 Hamsters can be social pets that love being held -- emphasis on "can be." If you aren't diligent about hand-taming your hamster and teaching him to enjoy being held, he'll never get past naturally fearing you and your enormous, grabbing hands. Training him to be held a little bit at a time ensures he'll grow fond of the experience and enjoy coming to you from his cage on a regular basis. Holding your hamster often isn't all there is to interacting with your hamster -- you have to hold him the right way, too. When you first get him, this means hand-training on a daily basis. After all, if someone you didn't know or trust wanted to envelop you in hands that are twice as big as your whole body, you might get spooked, too. Approach his cage making sure he sees you coming. Offer your hand to him inside, with a treat in it as a peace gesture. Do this at least once a day until he no longer hesitates to approach your hand. Once he's no longer afraid of your hand, you can pick him up. Cup him in your hand and remove him from the cage, holding him for just a few minutes before returning him. Do this at least once a day, every day, gradually increasing the amount of time you hold him. He'll get more and more comfortable with the process, and will eventually show signs of excitement when you approach for daily interaction, playtime and cuddles. Once your hamster feels comfortable with being held, be sure to hold him and play with him once a day. He's a nocturnal animal, so he'll probably want to play with you at night -- approach him in the evening after he's awakened. Hold him for a bit. All hamsters are different, so while some may be content sitting on the couch with you while you watch TV, others may prefer to be held for only a few minutes before they hit the ground running for a little living room exploration. Whatever the case may be with your own little one, he should have time outside of the cage every day. If you don't hold him regularly and train him to enjoy being held, you could face some slightly painful consequences. A spooked hamster is liable to clamp down with his tiny teeth, so holding him every day is an important step in avoiding bites. Equally important is patience and taking your time -- you can't rush your hamster into liking you. Spend time around him when he's in his cage so he can get used to your presence, and gradually work your way up to prolonged holding sessions.